This might have been posted before but I found it interesting that the steering wheel on my coupe is surprising similar to the one in this promo photo - allthough i believe mine is aftermarket. 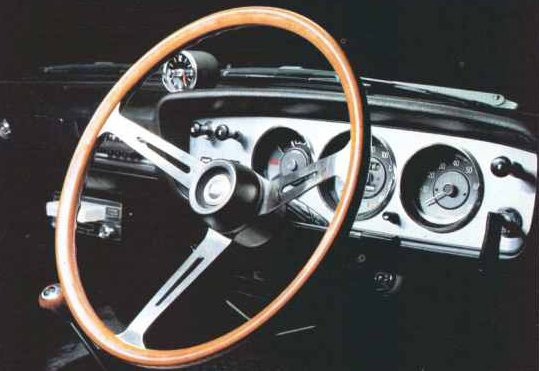 Yeah, that's the Factory Coupe Option wheel although I have a funny idea that they might have been standard in the Sunny GL Coupe model. now those two look similar but they're different in that they have plastic bits on the spokes where as the one in the photo has bare metal spoke with a elongated teardrop shaped cutout. on a side note check out the 4track tape player in the background - my mate has one in his eh and i reckon they complete that oldschool look - might have to hunt arround for one - i wonder if you can get datsun original ones? - anyone got one in their datto??? 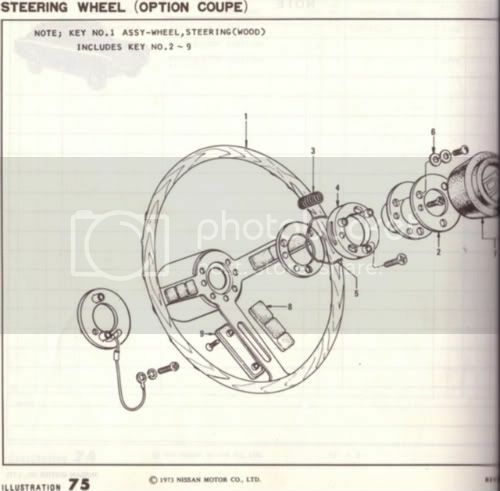 The steering wheel in the picture above has had the plastic 'pads' removed. This seems to have been a reasonably common practice, but it would have had the pads when new. See items 2 & 3 in the illustration. The 8 track was a factory accessory & for the JDM Sunny Coupe, the heater, radio, tach, gearknob & clock were all options while the tach, heater & radio seem to have been standard in the Aussie spec Datsun 1000 Coupe. For our overseas members, the 'eh' refered to in the previous post is a 1964 Holden, model EH. Don't know Benny, but this one could be more familiar to you. 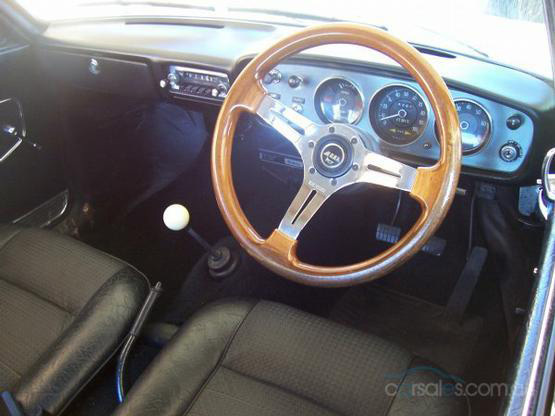 For those who have not seen one before, this is the factory Sunny/Datsun 1200 Coupe-Option wheel. Same wheel as 1000, but different hub [boss], & different horn button. I think Benny gets to see one on his way to work each day. i'm going with high, since i couldnt find anything on it through google. But that is a f*****g awesome idea!! They used to make converters that let you play cassetts in 8 track players and also FM tuners that plugged in. No not high... I saw it on Pimp My Ride! Yeah, you're right, I saw that instrument cluster too & wondered about it, Obviously at least ONE was sold without a tach. I wonder if the different state distributors wrote their own specs. I have never seen a Coupe Dash in NSW without one. 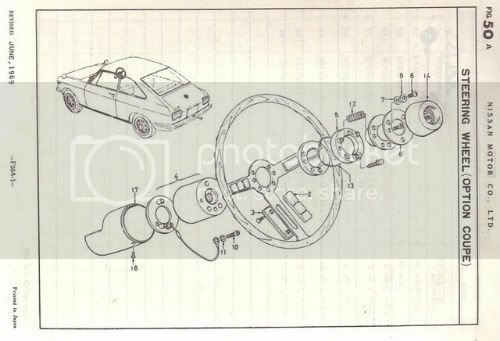 The wiring diagram covers both JDM cars aw well as export models & for some at least, the tach was obviously not fitted.